https://www.eurocircuits.com/wp-content/uploads/blog/Eurocircuits---Webinar-following-the-D&E-event-in-/thumb_webinar20data20preparation1.jpg 232 400 Dirk Stans http://www.eurocircuits.com/wp-content/uploads/2016/07/eurocircuits.png Dirk Stans2012-06-28 00:00:002018-05-14 16:04:17Eurocircuits - Webinar following the D&E event in Holland. This year’s free Design Automation & Embedded Systems Event had a record number of exhibitors though the number of visitors overall was down on previous years. 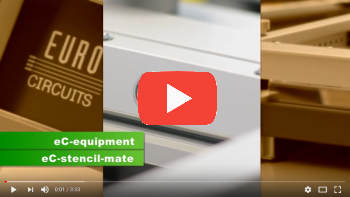 However the Eurocircuits stand was busy throughout the day as we gave our customers their first view of our new visualizer software tool and demonstrated our bench-top reflow soldering equipment, eC-stencil-mate and eC-reflow-mate. This year’s theme was product development. The event focused on new hardware, software and testing technologies which can ensure a smoother and faster development process. Visitors had a choice of 17 technical presentations given by the exhibitors who also provided a mini exhibition displaying their latest products and services aimed at embedded systems developers. The event has its own permanent website at http://de.fhi.nl/event/programma. Log in to find all the exhibitors‘ technical presentations. The website is mostly in Dutch but some presentations, like ours, are in English. Our presentation details the visual feedback which we provide on your PCB design from data entry to finished board. 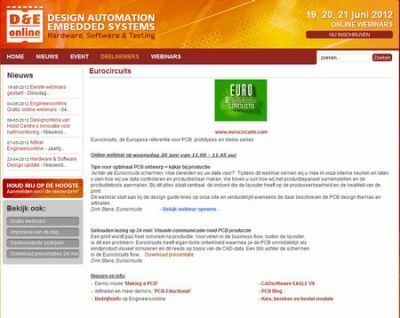 Following this event Eurocircuits organized a webinar on 20 June 2012 at 11h00 CET. The webinar is posted online for those who missed the live session. 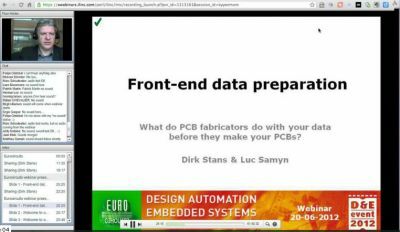 The webinar answers the question “what do board fabricators do with your data before they make your PCBs?” As well as answering this question, it provides tips on designing for improved manufacturability and on clear data presentation. “Why can’t they use my data just as I sent it in?” “Why do I need to know? I’m an electronics engineer and they are the board fabricators?”. 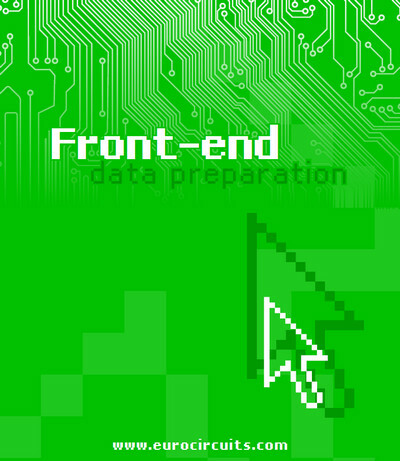 Our new white paper, “Front-end data preparation”, answers these questions. An understanding of the front-end data preparation process is important for two reasons, speed and cost. 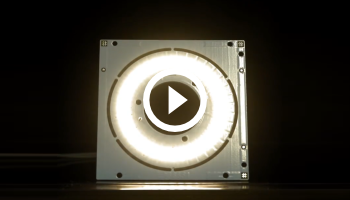 PCBs for time-critical applications need to be delivered fast and on time. If information is missing from the data set supplied or if it is ambiguous or unclear we lose time while the issues are sorted out. The new white paper explains how we verify that the data is complete and clear, to make sure that we deliver the board that you want. Above all, it contains tips on how to present clear and unambiguous data and avoid some of the common traps which can delay deliveries. Our pooling services have been developed to deliver prototype and small batch PCBs cost-effectively as well as fast and on time. The specifications of each service are based on a choice of base material and on a robust level of manufacturability to ensure the quality of the finished product. The white paper outlines how we check that each design fits the specification of the chosen service. If it doesn’t, we report back the data issues (raise an exception). Are there simple steps which you as a designer or we as fabricators can take to avoid having to use a more expensive option? If so we will propose them. Are there repairs we can make to bring the board back within specification and improve its manufacturability? In many cases we can make these repairs as part of the data preparation process and the white paper has links to more detailed information. Design for manufacturability tips highlight some critical areas. 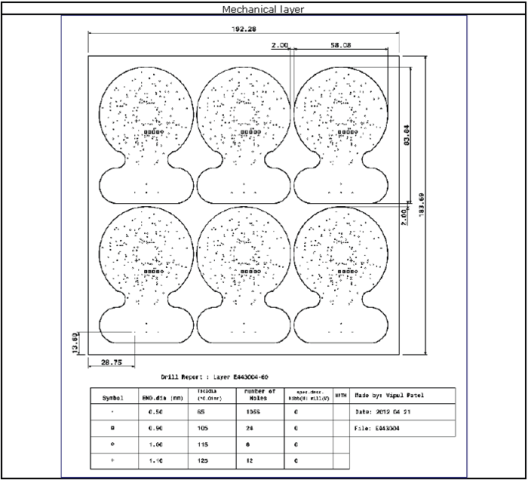 The white paper also links to the free design rule sets which can be uploaded form our website into EAGLE and Altium CAD systems to help ensure that your design meets the specifications of the most cost-effective pooling service. Although the white paper follows our internal procedures and includes the names of our front-end data preparation stages, our data preparation process follows industry best-practice. 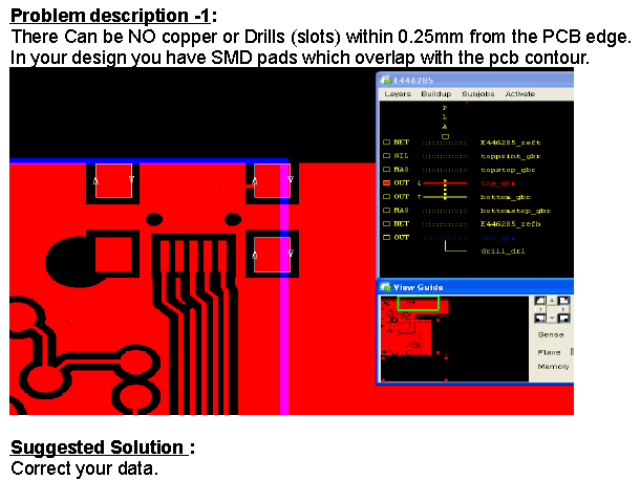 So throughout we relate what we do and our design tips to the wider PCB fabrication world. Our goal is to provide a broad set of technical information which will benefit not just our users but also the wider electronics engineering community across Europe. Download the Eurocircuits-frontend data preparation white paper in PDF format. To preserve the environment and to make use of the many embedded links to articles on our web site, we recommended that you read this white paper in its digital form. 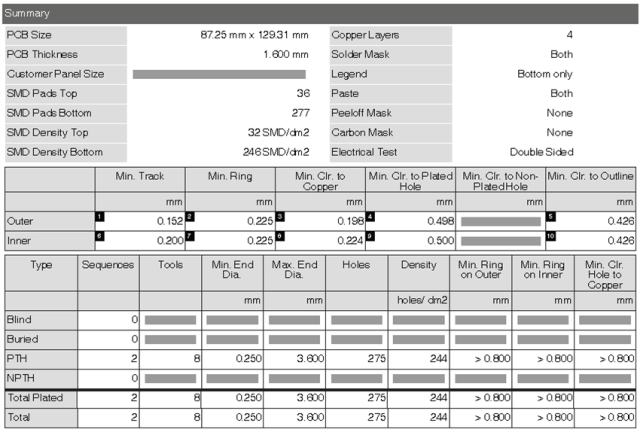 Eurocircuits production data – what’s in it? To produce your board we use your design data in Gerber or EAGLE format and first perform the necessary front end actions as described in our white paper: “What do PCB fabricators do with your data before they make your PCBs?“. When this is done and your board is ready for production, we save your board’s production data in your account. This data we call the job’s “single image” data. “Single image” means the data we load onto our order-pooling production multi-panels, so it may refer to a single circuit image or to a delivery panel if this is what you have ordered. 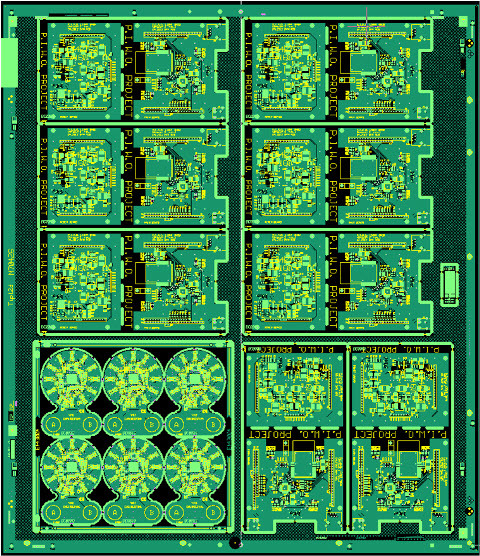 This is the data that is visualized in the PCB image. You can download the full set from within your customer account. The download of the single image production data from the Eurocircuits site has been possible since we launched our e-business platform more than 10 years ago. This open business policy has convinced customers over the years to come to us for their prototypes and small series even if they planned to have their large series produced in the Far East. We offer a fast and convenient way to calculate prices and place orders, a thorough data verification and manufacturability analysis and highly professional production processes. Combine this with the possibility to download the verified data and use it for production wherever else you want, and you have the best possible start for the life cycle of your products. 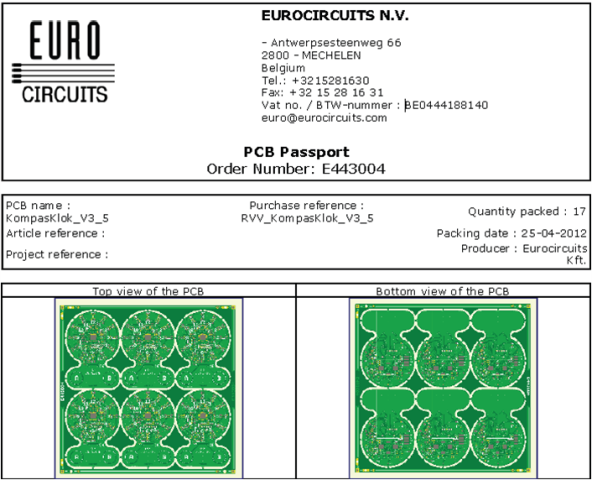 The single image files are name coded by Eurocircuits. But this is no secret either. Let us explain what the files are and what their names stand for. The format of the files is mainly DPF. This is the internal format for UCAM, the front-end data preparation or CAM (Computer Aided Manufacturing) system we use designed and developed by Ucamco. The paste files can also be downloaded as Gerber data. To read DPF files as well as Gerber data and Excellon drill files we recommend GC-Prevue, available as a free download from www.graphicode.com. We are sometimes asked if it possible to reload the single image data back into a CAD system. This is totally dependent on the CAD system. We have only input and processed manufacturing data. 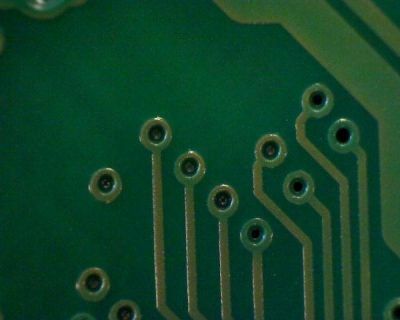 Other PCB manufacturers can use it for production through their own CAM systems. However the manufacturing data doesn’t contain any component information like foot-print coordinates or a functional net-list where nets are linked to component pin numbers and are described as power, ground, data line, etc… A successful reload of DPF or Gerber production data into a CAD system depends entirely on the functionality available in the CAD-system and should be investigated there. Our team will gladly answer any queries you may have. 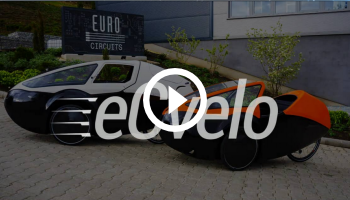 Contact us on euro@eurocircuits.com. https://www.eurocircuits.com/wp-content/uploads/blog/eurocircuits-production-data-whats-in-it/thumb_visualisation-customer-account.jpg 226 400 Dirk Stans http://www.eurocircuits.com/wp-content/uploads/2016/07/eurocircuits.png Dirk Stans2012-06-14 00:00:002018-05-14 16:29:17Eurocircuits production data - what's in it? As necessary background information we need to briefly introduce you into the technology of applying soldermask to the boards. The easiest production method is to have all vias open from both sides. The vias will be clean. They will not contain any contamination nor soldermask. The next picture shows vias free of soldermask. We did not expose the soldermask on the via pads so that it remains soft and is washed away during the developing process. 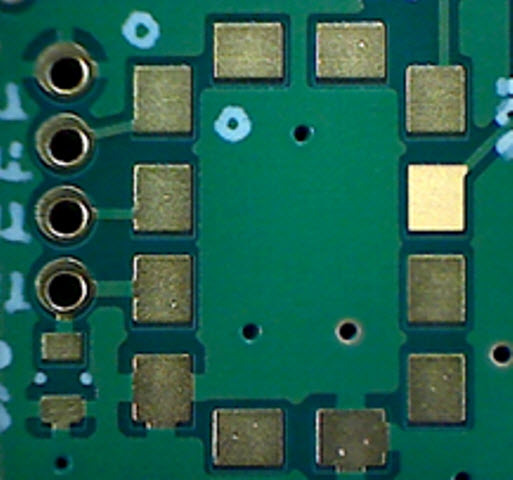 Another practical production method is where the vias are covered on both sides of the PCB. We expose the soldermask on both sides of the via-pad and via-hole so it will harden and stay on the via-pad and over the via-hole to close it. There is a risk however that (mostly in case of via-holes with a larger diameter) the via-hole is not completely covered and a small opening remains in the middle. 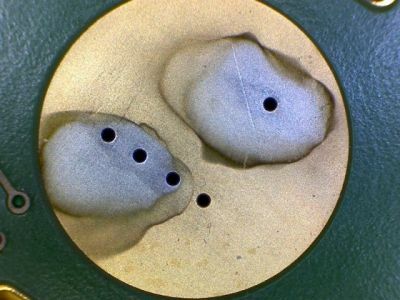 There is a danger that chemicals get stuck in these small openings during the processes that follow after the soldermask application. These chemical can contaminate and affect for instance the chemical Ni/Au process. A further danger exists that chemicals of the Ni/Au process remain in these openings and as they are agressive chemicals they might keep on reacting in the via hole years after the board has been produced causing possible failures in usage of the PCB in its application. The third case (vias covered from one side and open from the other side of the PCB) is the most problematic in production. This design creates a pocket. We expose the soldermask from one side but not from the other side. This soldermask in the middle of the via-hole will only be half polymerised. During the baking process this material can come out of the hole from the open side and contaminate the copper surface and thus disturb the surface finishing process. The pictures below shows a typical failure. 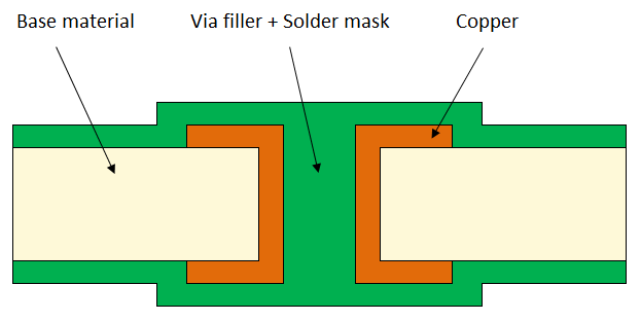 Vias that are not completely covered or not properly filled with soldermask may create “skip pads” in the ENIG process. Modify the layout so that all vias are open. Our engineers favour this solution. Sadly this is not always accepted by our customers or the design may not allow it. 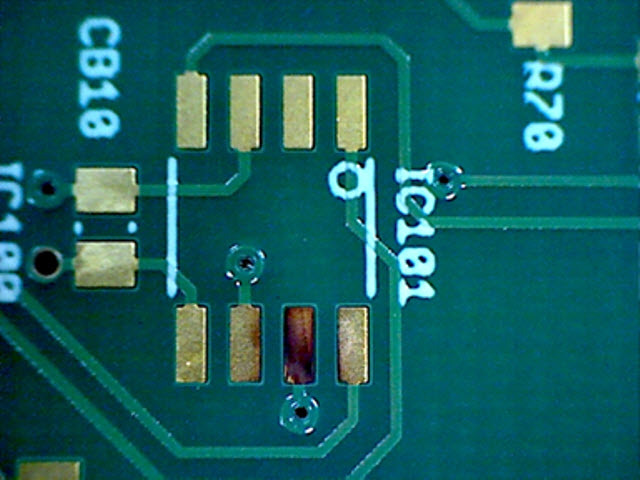 Apply the soldermask after the ENIG process. This is a costly solution as all copper surfaces are gold-plated and the soldermask adhesion becomes worse. For closed via-holes we have developed an alternative solution which avoids chemicals getting trapped in the partially closed via-holes during developing of the soldermask or during application of the Ni/Au. Before the coating the entire panel with soldermask we selectively print soldermask into the via holes using a stencil. During a second print run we then cover the whole panel. This way the via-holes are completely filled with soldermask. 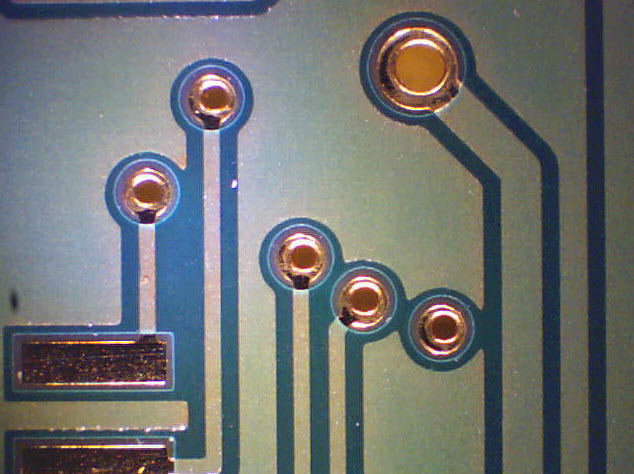 An even layer of soldermask now covers the via-holes leaving no pockets to hold residual chemicals. We have used this technique for over 6 months, and it has proved successful in dramatically reducing the number of skip pad problems. The following movies show this process of via filling and soldermask printing. Make real-life PCB information available to everyone involved in board design, procurement, manufacture, assembly and testing. If you upload your data to get an On demand price (Place inquiry with data), we run a full data analysis before we complete our offer. 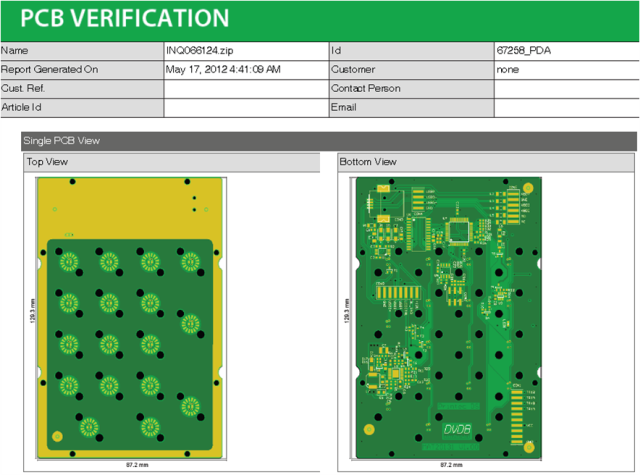 You can find this online as the PCB verification report. This includes a true-colour picture of your PCB, the build as specified in your data and a detailed overview of all technical parameters. 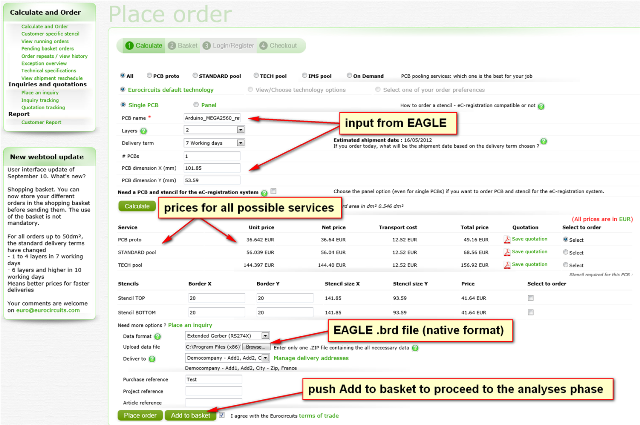 Customers who use EAGLE 6.x as their PCB layout system, can link directly from within their design to our web site and its calculator. Just push the PCB quote button. 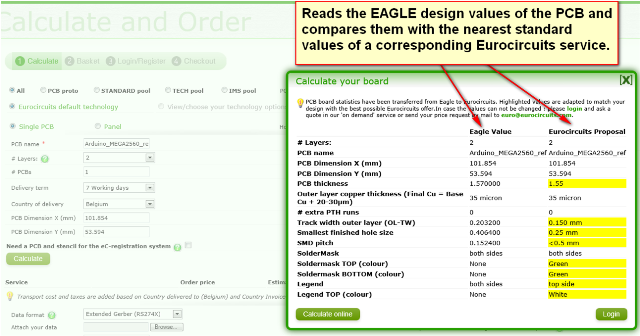 The link between EAGLE 6.x and the Eurocircuits web site activates a window that displays your EAGLE PCB design values and the corresponding design values of the Eurocircuits pooling services. TIP: if you use the DRU design rule files for our pooling services you can be confident that your design will perfectly match your chosen service. Download the DRU files here. 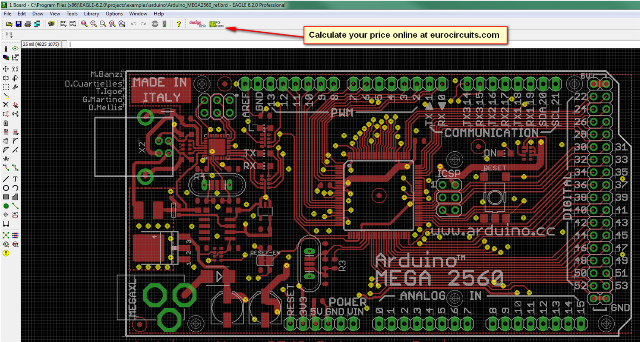 Calculate your price and attach your PCB data. You can then add the offer to your shopping basket. This will trigger the automatic analysis of your data. This step is currently in beta test and will be live shortly. As soon as the analysis is complete the word “Visualizer” appears. 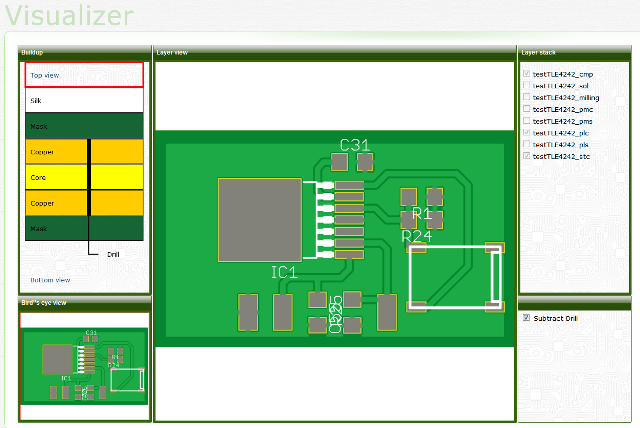 Click it to link to the PCB Visualizer module. See the movie. Most customers use Extended Gerber PCB layout data. Enter the board parameters into the Calculate and order menu. Calculate the price and attach the data. Add the offer into your online and the system will run the analysis and open the link to the PCB Visualiser module as described above. See the whole procedure in our movie. If there are data anomalies we raise an exception. We prepare a clear visual report on the issues with suggestions how to resolve them. We send you an email to warn you. You can then find the report in your online account. Next we complete the preparation of the single image (for more information on this step visit our blog). 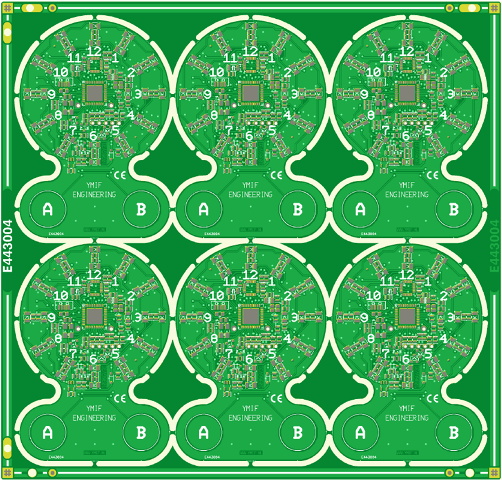 The PCB is now ready for production so we create the final PCB image. This shows the finished PCB as it will be delivered, as a single circuit or in a customer panel, depending on what you have ordered. 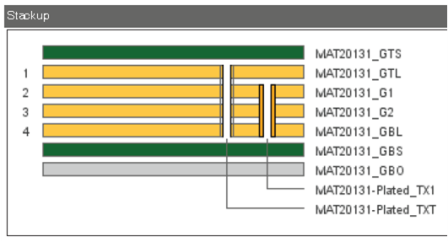 For our internal production team we provide a visualization of the production pooling panel. The board is also visualized on documents we provide for you. 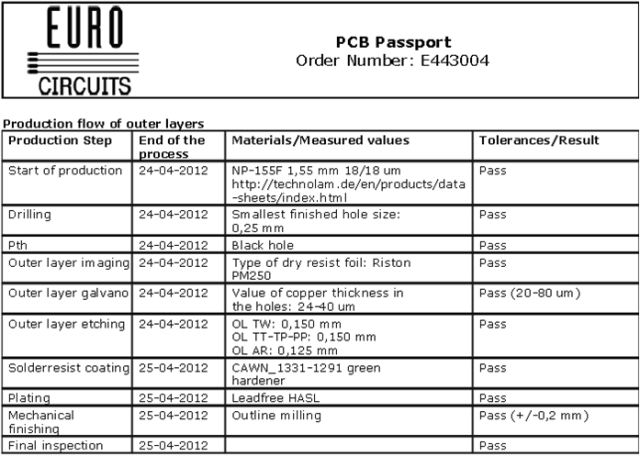 Our PCB passport is the PCB identity report containing production and material traceability data. 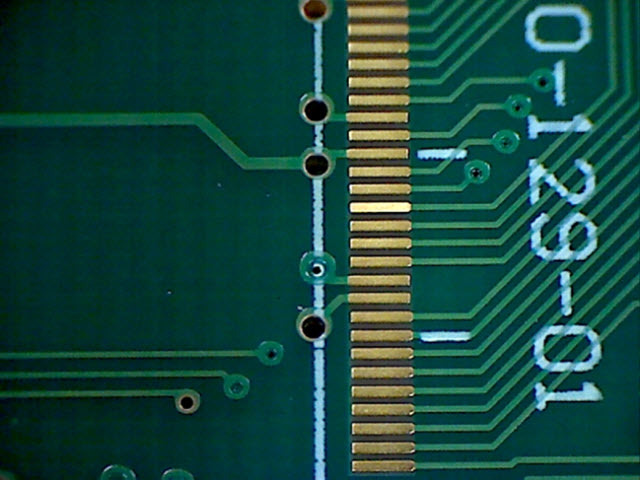 This is accompanied by visual images of the PCB”s top, bottom and mechanical layers. 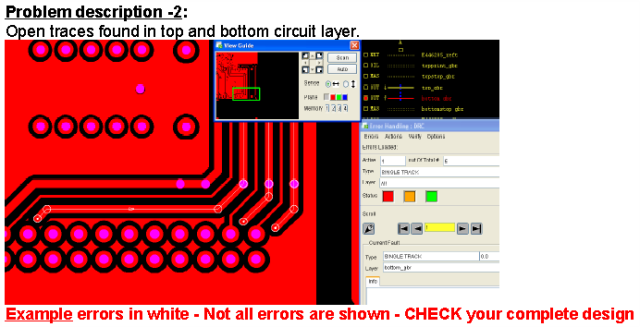 That way, even non-technical people can quickly and easily identify the PCB. We use the same visual identification in the overview of running orders and in the order history. 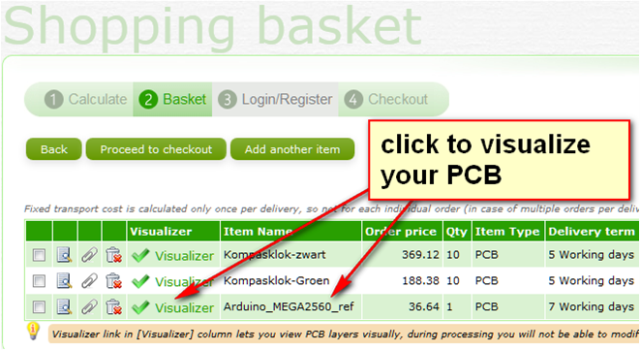 Click on the visualisation icon to see the PCB image and make sure that you are re-ordering the right PCB. The first module of the PCB Visualizer, our new program for PCB visualization, will be rolled out shortly. 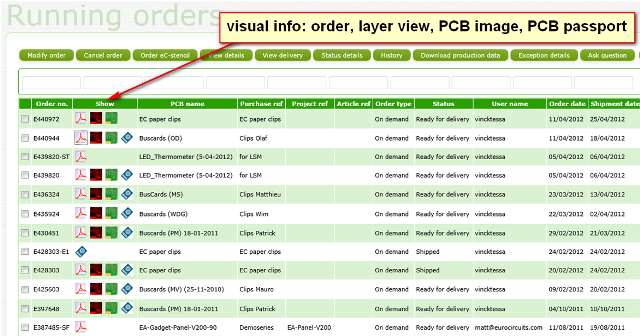 As soon as your data is uploaded, PCB Visualizer will present a complete view of all the layers of the PCB in true colours. It will also show the build as it appears in the data set. The next step in the roll-outwill be to provide interactive functionality at each stage of the data preparation process, as shown in the diagram below. This will help to avoid mistakes due to misunderstood communications or errors in the data. These stages will include tools to edit the order details, for instance by changing the surface finish or soldermask colour, as well as tools to view any data anomalies and accept our suggestions for repairs. The final stage will show all the layers of the production-ready PCB.